Veselé Velikonoce! – Happy Easter! Easter is upon us again and I wish one and all a great holiday weekend. Please check out my long standing post about Easter in the “Holidays” section of the drop down menus to get an idea of how the holiday is celebrated in the Czech lands. Vila Stiassni, in Brno, one of several monuments available to view and explore through a new 3D website launched recently. Very recently the National Heritage Institute (Národní Památkový Ústav) of the Czech Republic launched a new website that allows you to explore various heritage sites around the country in 3D online. The site works with both traditional mouse control and touch screen technology and can be used with virtual reality technology as well. New Czech Law Sticks it to Scammers! Very recently, the Czech government passed a new law that puts more power in your hands when dealing with dishonest money exchangers. The law was put in to help combat money exhange scammers which are rampant in the centre of Prague. However, it’s a national law and can be applied anywhere in the country. Very simply, the new law gives you the right to demand your money back within three hours of a bad exchange. You can involve the police if need be. Monday, the 25th of February, marked the 96th birthday of Major-General Emil Boček. Major-General Boček was one of the many Czechoslovak airmen who escaped their occupied homeland during the Second World War and fled to Great Britain to bolster the ranks of the Royal Air Force. Boček is the last surviving of those pilots. In the video, mention is made of another pilot, Brigadier-General Miroslav Liškutín, who’s passing in February of 2018 left Boček as the last surviving of those heroic Czechoslovak pilots. During 2019, it is planned that Boček will be promoted to a full General and will be presented with the Order of the White Lion – First Class, the highest honour the Czech Republic can bestow on its citizens. Today, the 2nd of March, marks the 195th anniversary of the birth of Czech composer, Bedřich Smetana. A proud Czech, the Czech lands inspired much of Smetana’s work. Very recently, Beyond Prague was noticed by a couple of parties and I’d be remiss in my duties as a blogger if I didn’t thank them publicly. Firstly, I would like to thank the Travelosource website for visiting Beyond Prague and thinking highly enough of it to place a link to it on their page of Czech Republic travel resources. In the sidebar, you’ll notice their logo. Clicking on it will take you directly to their Czech Republic page. I also wish to thank the people at the Čezeta scooter company for paying a visit and linking my recent article about their scooters to their Facebook page. It’s always great when those who I write about take notice and show their thanks. The reciprocal effect is that through linking that article to their Facebook page, I got a big spike in my blog stats and the article became the blog’s most shared article literally overnight. Get on Your Pig and Ride! An example of a 501 series Čezeta. The 501 was the first of the classic Čezeta line and debuted in 1957. Motor scooters are a very popular way that many people around the world choose to get around, particularly in crowded cities where parking for traditional four wheel cars tends to be at a premium. Indeed, the entire point of the motor scooter as a vehicle has always been a balance of economical operation and effective utility. Through the 1950s, many more companies around the world began producing motor scooters as demand for them was growing. Through the late 1950s and into the early 1960s, the motor scooter truly came into its own as a popular vehicle with youth in many places as it came to be a symbol of status and affordable freedom for young people with lower paying jobs. 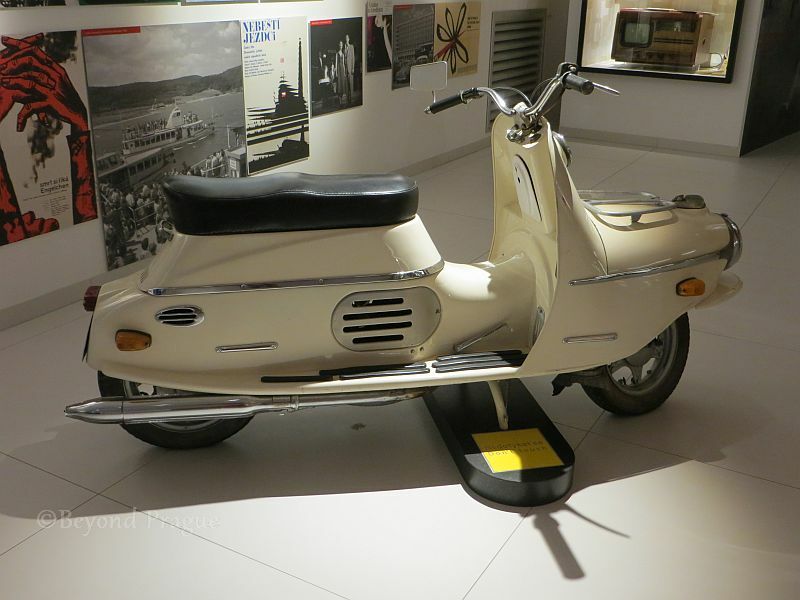 The scooter became an inseparable part of the Mod subculture which was popular in Great Britain through the late 1950s to the mid 1960s. 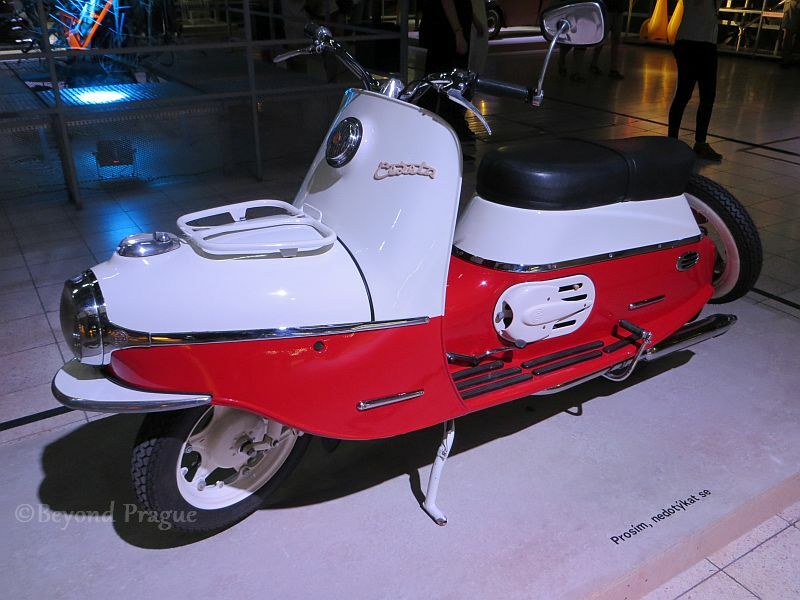 The Čezeta debuted in 1957 and was the former Czechoslovakia’s contribution to this golden age of motor scooters. Immediately distinguishable from its contemporaries by its very different design which included a long front section ahead of the driver that terminated in a single headlamp, this aspect of the vehicle’s design would see it given the affectionate nickname of “Pig” in its homeland. Indeed, with its long snout, the Čezeta resembled that farm animal more than anything else. The Čezeta exists in both a classic and a modern line. The classic line was produced from 1957 to 1964 and encompassed three versions. The Čezeta was revived in modern form in 2017; though the classic shape has been kept, the modern version is a very different breed of pig from the classic. Another angle on a 501 series Čezeta, showing the lines that gave it the nickname of “Pig”. The Čezeta was designed by Jaroslav František Koch (1893-1983). Born in a small village near Prague, Koch studied industrial design and spent the First World War and immediate post war years working for aircraft companies. Koch was an accomplished motorcycle racer and was responsible for designing the legendary Praga BD 500 series of motorcycles which were produced between 1927 and 1935. In 1940, shortly before being hired by Česka Zbrojovka (ČZ) at the company’s Strakonice factory, Koch took out a patent on a scooter of quite revolutionary monocoque design. A Monocoque design uses the vehicle’s body shell to give structural inegrity and strength rather than a separate internal frame that the body shell could be attached to. The biggest advantage to the monocoque frame was savings in materials and weight. ČZ Strakonice became one of the world’s most prolific and successful producers of racing motorcycles from the immediate post World War two years to the mid 1980s. Koch was truly in his element and it was during his time at ČZ that he designed the Čezeta. An example of a 502 series Čezeta with trailer attached. The design of the Čezeta was a clear departure from those of its contemporaries. Other than satisfying the requirements to classify as a scooter for licensing purposes and giving young people in the former Czechoslovakia and other former Socialist countries in Europe a taste of affordable freedom that western scooters were giving to the youth in other parts of the world, the Čezeta was a very different animal indeed as scooters went. Aside of the aforementioned monocoque body design and “snout” on the front, the Čezeta also featured a notably longer wheel base than other scooters. The advantages of all these features gave the Čezeta a very strong structure, better ergonomics for both driver and passenger as well as improved cargo carrying ability. 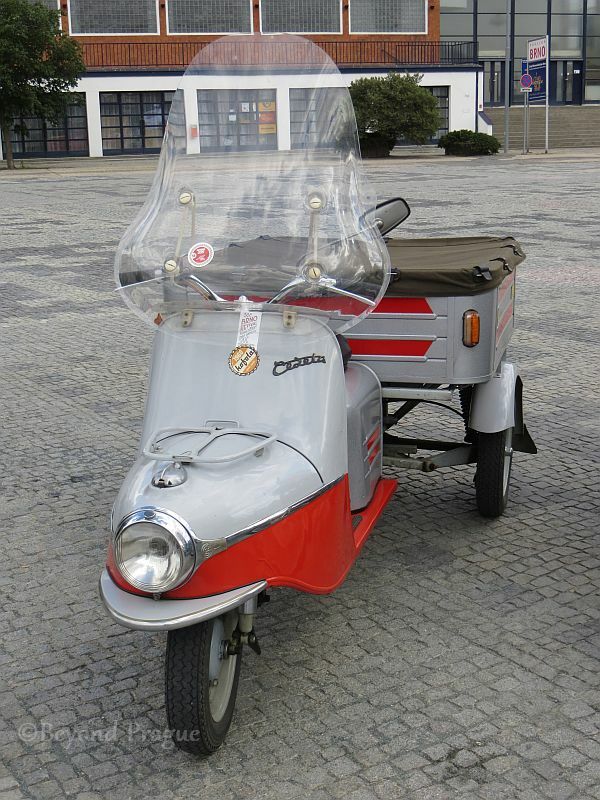 The “snout” was the key to the Čezeta being able to carry more than other scooters as it allowed the fuel tank to be put out front in a position over the front wheel, thus freeing up more cargo space under the seat. It also created space for a small luggage rack to be mounted on the front section of the scooter. The classic line of Čezeta scooters comprised three series: 501, 502 and 505. The 501 and 502 were scooters in the truest sense while the 505 brought the utilitarian qualities of the vehicle to the fore. The 501 series was built between 1957 and 1960 and was built in six sub-variants which were primarily differentiated by changes to the engine and its cooling system. Debuting in 1960, the 502 series brought a number of improvements including better suspension and engine starting systems. The 502 also brought with it a modest increase in maximum speed and significant improvements in cargo and passenger carrying ability in the form of an available trailer and the ability to be fitted with a side car. The sidecar itself was made by a company called Drupol and was given the name “Druzeta”. The 502 series was built until 1963 and existed in four sub-variants. An interesting chapter of the Čezeta story occured in 1960 when the NZeta debuted. The NZeta was a license produced version of the Čezeta made in New Zealand from imported Čezeta components and 25% locally made parts in accordance with import laws at the time. NZeta production lasted for three years. The 505 series changed the scooter to a transport vehicle first and formost. Built between 1962 and 1964, the 505 series took the front end of the 502 series and married it to a steel rear frame to create a tricycle vehicle with an emphasis on transport. The 505 could be fitted with a variety of rear cargo sections that included flatbed and cargo box options as well as a van body with a completely enclosed cabin for the driver. The 505 series had a maximun hauling capacity of around 200 kilograms which made it quite useful for small delivery and courier work as well as light transport around agricultural and industrial sites. All members of the classic Čezeta line could be fitted with an optional clear plastic windshield for increased protection from debris. Roughly 20 years after the last Čezeta was built, ČZ Strakonice faded from the motorcycle manufacturing landscape and the scooters they produced became collectible rarities. 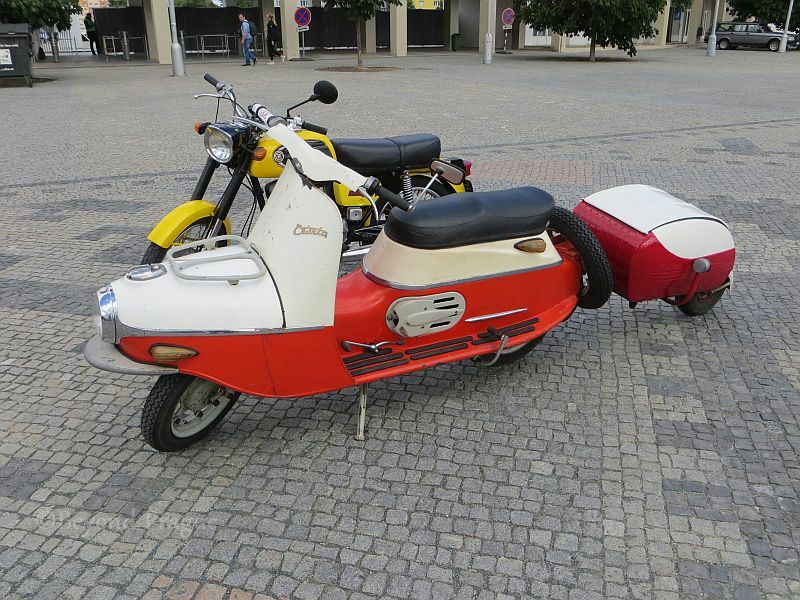 Today, the best chance of seeing one of these classic scooters is at a vintage automobile event or automobile museum in the Czech Republic. The rights to the Čezeta name and design were purchased by Prague based British expatriate, Neil Eamonn Smith. Smith set up the Čezeta Motors s.r.o. company in 2013 to begin the production of a new generation of scooters under the Čezeta name. The first of this new generation debuted in 2017 as the series 506. While the new generation of the scooter has faithfully kept the look of the classic line, everything else is different. The 506 series is fully electric rather than petrol powered and has a composite material body shell over an internal frame as opposed to the metal monocoque construction of the classic series. The new Čezeta is planned to be limited production only and built to order by individual buyer. As such, the new series is aimed for those with a taste for nostalgia rather than a want for utility. These articles contain some interesting reading on the NZeta. Looking across the convent courtyard. Plasy is a small town in West Bohemia that sits roughly in the centre of a triangle formed by the cities of Karlovy Vary, Plzeň and Prague. The centrepiece of the town is the expansive former Cistercian monastery that sits near the Střela river that runs through the town. 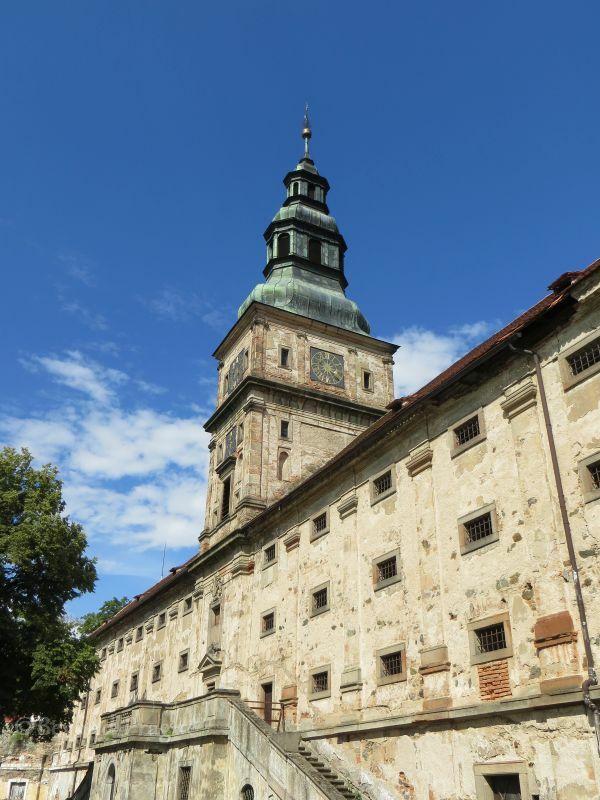 This monastery is considered to be one of the best preserved Baroque style structures in the Bohemian regions. While the current look and layout of the monastery dates largely to the 18th century, the monastery at Plasy was originally established in 1144. Misfortune befell the monastery and Plasy during the Hussite Wars when the monastery was burned to the ground in 1421. The monastery and surrounding community didn’t really begin to recover until after the end of the Thirty Years’ War. A constant program of rebuilding and expansion began in 1661 and lasted until the monastery’s abolition in 1785. The former monastery was taken into private hands in 1826 when Austrian Empire Chancellor Klement Václav Lothar Metternich purchased it in order to expand his existing land holdings in the region. Under Metternich’s ownership, the monsatery’s prelature building was converted to a chateau for he and his family to live when they were there. Several of the other former monastery buildings were also repurposed and converted during Metternich’s tenure there. This period of the monastery’s history ended in 1945, when it was seized and taken under state control. During the 1950s and 1960s, the buildings were further altered and repurposed. Work on restoration of the monstery would not begin until the 1970s. In 1995, the monastery was declared a National Cultural Monument. Today, the monastery is still very much a work in progress as far as restoration is concerned. However, much has been accomplished and some buildings in the structure are open to the public for tours. 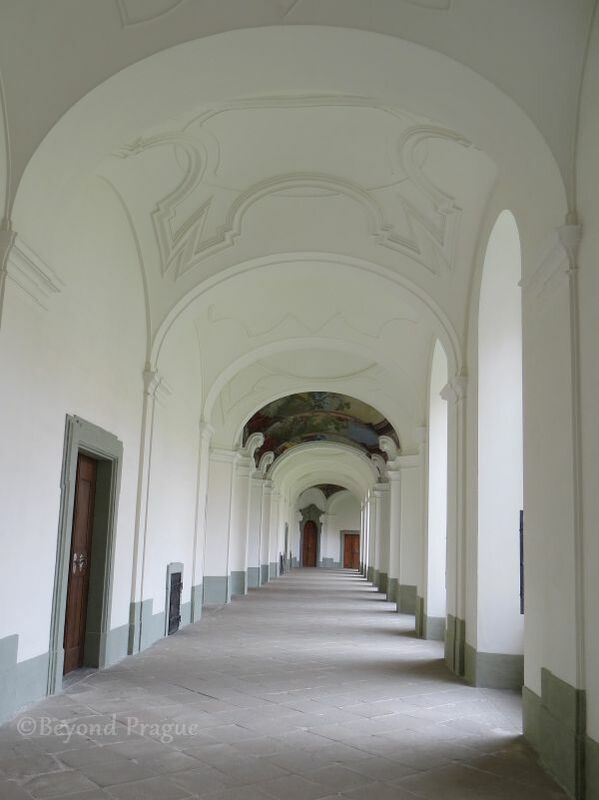 Looking down a convent corridor. Of the eight buildings that comprise the monastery site, the convent is really the heart of the place and the subject of the main tour when you visit. 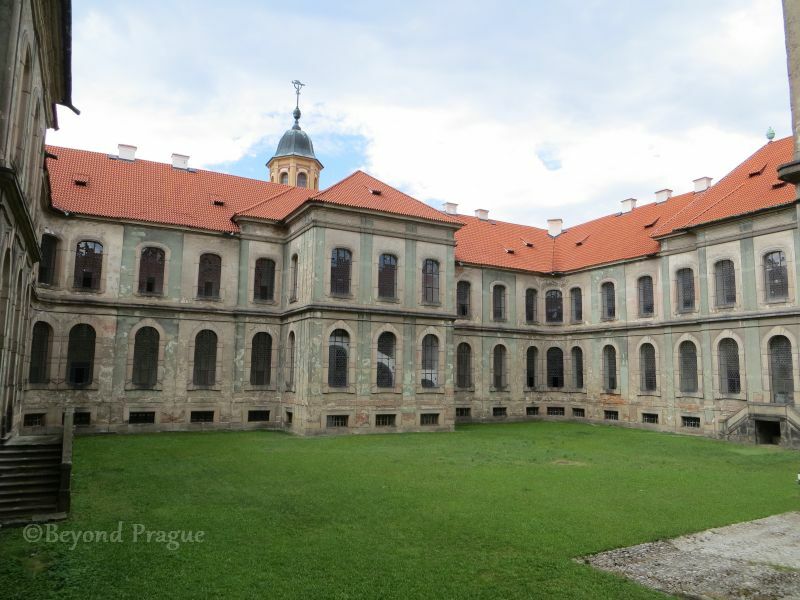 The convent was constructed between 1711 and 1740, many prominent Czech artists and craftsmen of the day were contracted to create the convent’s structure and decorations. Notable among the people involved with bringing the convent into reality was Jan Blažej Santini Aichel (1677-1723). A Czech architect of Italian ancestry, he holds a special place in the nation’s architectural history for his flexibility and inventiveness within the Baroque Gothic style. A number of his works went against ideas of the time, yet still retained key hallmarks of the style. The first problem Santini had to overcome when designing the convent was how to support the massive structure’s weight on the marshy soil of the Střela river’s floodplain. His solution was to give the building a deep foundation on a system of wood pilings. One of the water testing pools visible on the tour. Approximately 5,100 oak pilings were driven into the soil and topped with an oak beam grate. To this day, the weight of the convent is supported on that system. 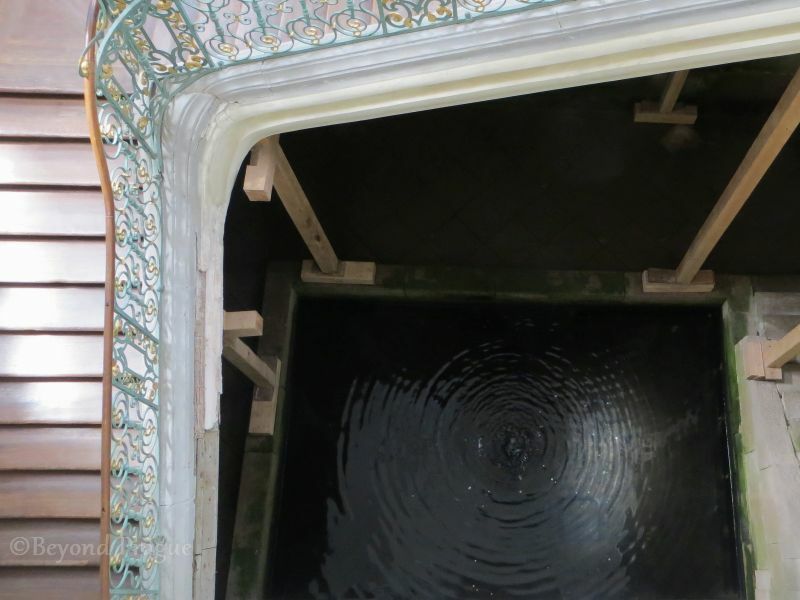 While the pilings and grate are kept completely submerged and can’t be seen, there are two water testing pools in the convent that you can see on the tour. Water quality is tested a number of times per day at these pools. Sanitin Aichel also created a series of underground canals and a water pressure system to ensure that the wood foundation would stay completely submerged to protect it from rotting. The same system also provided some protection to the monastery from flooding. Santini Aichel also contributed a complex series of self supporting staircases and an intricate spiral staircase to the convent’s structure. Santini Aichel died before the convent was completed and his work was seen to completion by Kilián Ignác Dientzenhoffer (1689-1751), who spent some time studying under Santini Aichel, in 1740. Fresco of Saint Bernard in the chapel that bears his name. Beyond the architectural qualities of the convent, the more artistic and academic aspects are also well covered on the tour. The convent contains a number of fresco paintings on the ceilings of the corridors and in two chapels. 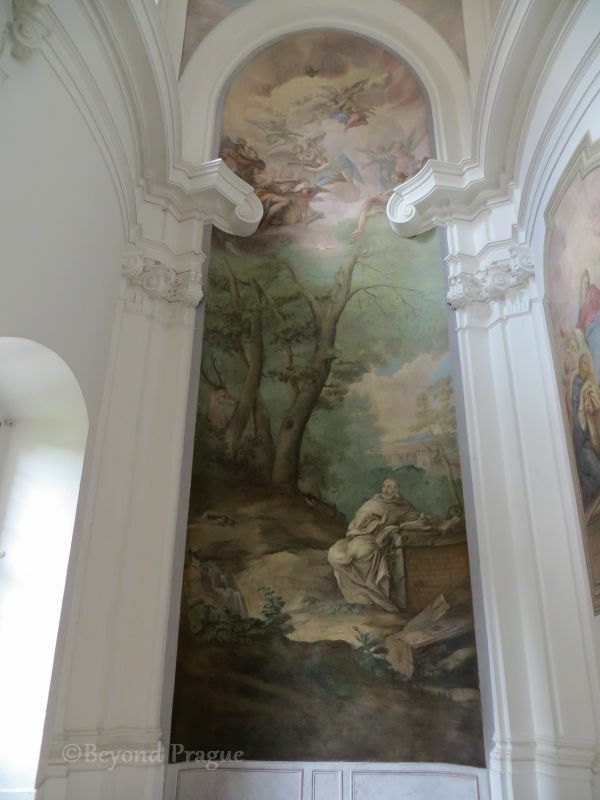 a number of notable local painters of the day were contracted to do these frescoes. Among these painters were Petr Brandl (1668-1735) and Jakub Antonín Pink (1690-1748). Also in the convent, you’ll find the winter refectory, former monastery library and study hall as well as the large Capitular Hall. The Capitular Hall was where new monks were accepted into the monastery and where new abbots were elected. 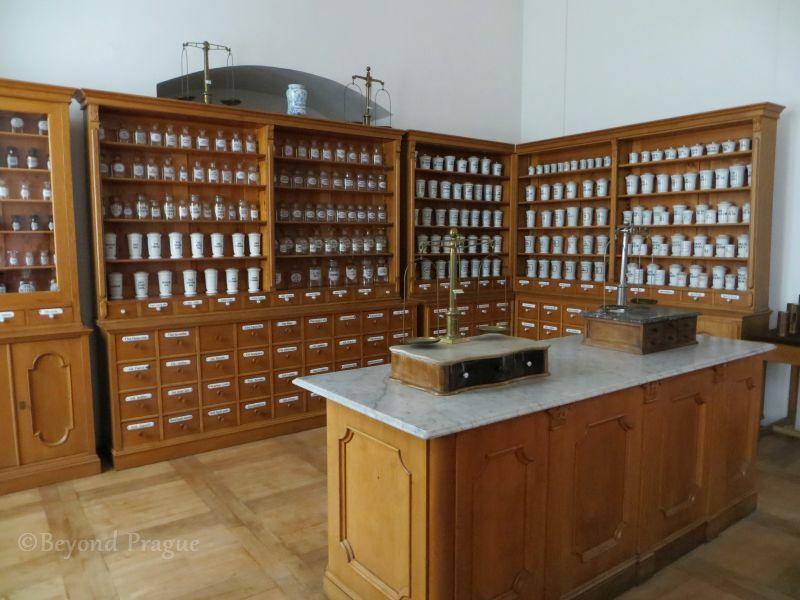 In its day, the monastery at Plasy was well regarded for the quality of medical care it provided, the monastery pharmacy was particularly well reputed and produced a stomach medicine that became much sought after for its effectiveness. Known as “Plasy Powder”, the monastery kept its recipe a tightly guarded secret. As popular and lucrative as their invention was, it was certainly within the monks’ interest to protect it. As mentioned earlier, the convent is the main tour at the monastery. As with most historic sights in the country, the bulk of tours are in the Czech language though it is possible to obtain texts in other languages to help non-Czech speakers follow along. Tours in English or German can be arranged as well. The convent tour lasts around an hour. It is also possible to tour the clock tower building though tour options for it are a bit more limited. The monastery is not difficult to access by road or rail from Plzeň. As the Plasy townsite is also on a number of of local cycling and walking trails, it can be accessed by those means as well. If you choose to visit the monastery during summer high season, you may want to pack snacks with you or eat before you embark on your trip. We arrived in Plasy around the noon hour and somewhat hungry to find that there are only two restaurants near the monastery and they were very popular and busy at lunch time. We had to wait a bit for seats to become available.